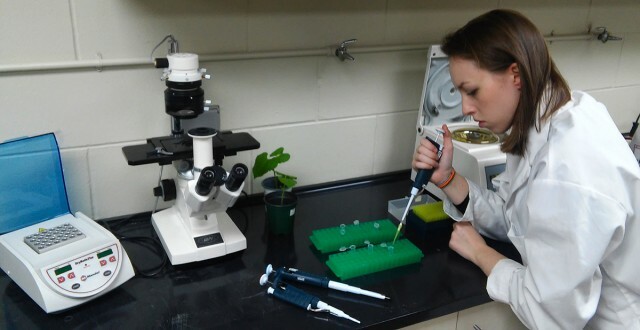 Charlotte Smith works in the lab, where she'll be helping analyze the DNA of various soybean diseases this summer. A three-year research project starting this summer will help soybean farmers predict disease before it strikes their crops. Brandon University’s Dr. Bryan Cassone has received $112,509 from the Manitoba Pulse & Soybean Growers (MPSG) to genetically analyze whole fields of soybean plants, looking for the distinctive DNA markers of disease, even well before symptoms appear. He’s focusing on foliar diseases, which are those that invade the leaves of infected plants. Common examples in Manitoba include downy mildew and bacterial blight. With help from MPSG and Manitoba Agriculture, Food and Rural Development (MAFRD), Dr. Cassone will do two full surveys of at least 50 fields each in Manitoba looking for those and many other diseases. “Their years of experience will also allow us to target fields particularly vulnerable to disease,” he explains. In each field, they’ll pluck a single leaf from every soybean plant, preserve it on ice or in a special preservative, and take it back to a BU lab to be fully sequenced. That will tease out DNA from any kind of disease that the soybean plant could be harbouring — including some that may have never before been detected in Manitoba. Helping him in the lab this summer is student Charlotte Smith, who’ll be entering her second year of nursing in the fall. She already has a bachelor’s degree in biological sciences under her belt. She says this type of hands-on experience is an invaluable part of her education. While some sort of lab work has always been a part of the university experience, this project involves a type and scale of high-tech work that has only recently become cost-effective to do. The large-scale surveying and analytical work being tackled in this project is a continuation of Dr. Cassone’s post-doctoral research at Ohio State University, and has the potential to make a big difference to prairie soybean growers. “Before I moved to Manitoba last September, I spent four years working on soybean. I knew growers place an emphasis on preventative research, much more so than other crops. I also knew that soybean production had exploded in the province over the last few years,” he says. In fact, soybean farmers in Manitoba harvested a record 1.4 million tonnes of the crop last season, the fourth record-setting year in a row according to Statistics Canada, and more than 25 per cent higher than the year before. Grower interest in soybeans is expected to remain high, with 2016 having been named International Year of Pulses, which includes beans, lentils and peas. Having a direct impact on real-world issues is something that Smith says is a bit of a thrill. Among other pieces of the puzzle, Dr. Cassone says his work can help reduce the amount of spraying that producers would need to do. Smith says she can’t wait to see what she and Dr. Cassone discover over the summer. In the future, this research will help develop models to predict when and where diseases could strike — before they appear. Combining information about the number and type of pathogens with information on known environmental factors like temperature and humidity will lead to sophisticated computer models that will zero in on regions in Manitoba that are more susceptible to a given disease in a given year. Building on the baseline of data from this project, Dr. Cassone expects to be able to determine which diseases pose the greatest risk to future Manitoba soybean yield. “Ultimately, we want to use these models to help shape our spraying regimes and help sustain the integrity of the crop in Manitoba,” he says.